In 2014, the City of Meriden requested proposals for the development of several city-owned properties in the newly established Transit- Oriented Development District. The team of Kenneth Boroson Architects, Torti Gallas and Partners, and Michaels Development was selected to develop a 1.6-acre plot that once held the Record- Journal newspaper headquarters. Located at the junction at Crown, Perkins, and Colony Streets, the new construction project consists of three separate buildings: a four-story elevator building to include 63 apartment style dwellings, and two three-story town house strings to include a total of 18 units. Through this neighborhood transformation, Meriden aims to create a mix of housing types that serve the needs of current and future residents of all income levels. Of the 81 total dwellings at 11 Crown Street, 80% will be affordable housing and 20% will be market price. 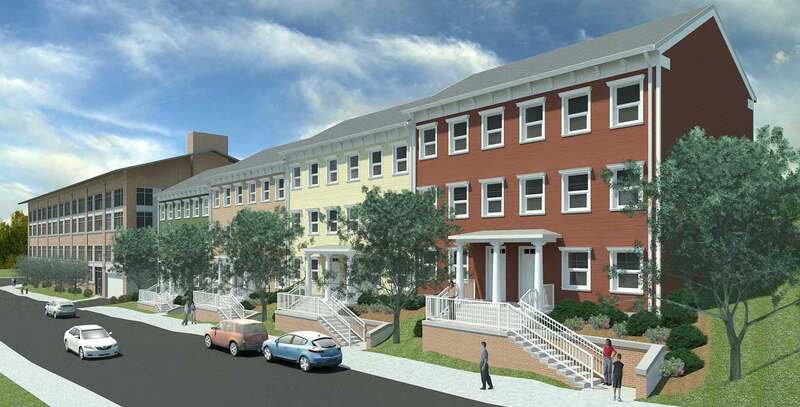 After a completing a competitive application process, the project received 9% Low Income Housing Tax Credit Funding from the Connecticut Housing Finance Authority (CHFA). Along with programming and affordability, CHFA factored the project’s incorporation of Passive House into the funding scoring system. All criteria considered, this project was awarded the highest point value in the state. Although Passive House exponentially cuts the cost of heating and cooling, it comes at the price of meticulous construction. The specifications required to achieve Passive House certification led to challenges in the design process of 11 Crown Street. An optimal Passive House design features flat walls in continuous plains, allowing for an airtight building. The original conceptual design for the development featured multiple reliefs and setbacks for certain windows in the façade of the buildings. However, once the concept of Passive House came into play, the façade design and wall construction required revision. The insets were scaled from a few feet back to a few inches in to accommodate for the PH requirements and multiple layers of insulation. Passive House certification was not the only hurdle the project presented. The team of architects and engineers were presented with complex site conditions. One edge of the trapezoidal shaped site was almost 30 feet higher than the opposing side. With such a steep pitch on only 1.6 acres, the topographical grading proved to be multifaceted. In addition, a corner portion of the site is located within a 500- year flood plain. As a result, a double sidewalk was included into the design, part of which provides a route to evade potential flood conditions. Finally, the design team faced the challenge of incorporating the vernacular of downtown Meriden into the new construction. To do so, the building types were based on historic precedents. Referred to as the “Silver City”, Meriden was once a bustling center for manufacturing. Over a hundred years later, Meriden is now a post-industrial urban community but historic factory buildings still punctuate the town. This industrial antiquity can be found in the elevator building at the top of the 11 Crown street site, which features a new brick exterior and 8 x 8 foot windows on each floor. With the factory building towards the more public area of the site, the development shifts in scale as you move away from the urban center of downtown into neighborhood of residential town houses. The completion of 11 Crown street, scheduled for late 2019, will play a role in radically transforming the housing landscape of Downtown Meriden. With its implantation of Passive House standards and the availability of mixed income housing, the new development will serve a new multi-generational and diverse downtown population.